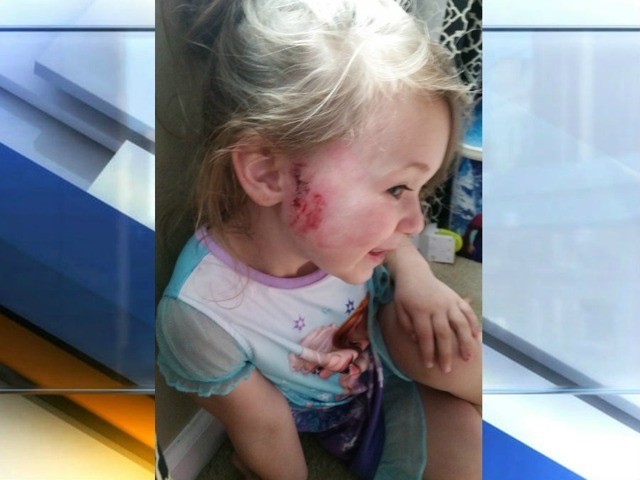 A Noblesville family is demanding justice after they say their little girl was attacked by a dog while playing in her own front yard. The Williamson family says their daughter, Maizy, was in the front yard on the grass when a neighbor came jogging by on the sidewalk with his dog. They say that dog was on a six-foot leash, and it lunged onto their property and bit their daughter on the face. The 4-year-old needed 13 stitches, according to her parents, and she will now need plastic surgery to fix the damage from the bite. The family has filed a lawsuit against the dog’s owner, Jason Willy, saying he should have had better control over his dog. They say the dog has shown aggression with other dogs in the neighborhood, and Willy should have had him on a shorter leash so he didn’t have the ability to lunge at their little girl. After everything their daughter has gone through, the family wants other dog owners to know that it’s their responsibility to be in control of their dogs. “Even if your dog hasn’t shown a history, as the owner you have to take responsibility. You should be a defensive owner; you have to be the one that is looking out for other people. We shouldn’t have to worry that I’ll turn around and get bit,” said Westin Williamson, Maizy’s father. RTV6 reached out to the dog’s owner, Willy, but we have not yet heard back from him. This one tells that we need to get back to ANY DOG rules -- any dog that bites a child like this gets put down, period. Let's hope this little Willy jogger is now afraid to jog in his own neighborhood due to angry neighbors. Even though Jason Willy has not gotten back to RTV6, I'll take it upon myself to speak for him. My pit bull, Psycho, was just protecting me from that menacing 4-year-old girl. That little girl provoked Psycho. She was sitting there playing with a pit bull voodoo doll, and said that she wanted to give it a dirt nap. Psycho has never been aggressive before. I thought he was going to lick the little girl to death. My bad. I can't help it if people leave their kids within reach. They should know better than to leave their kids unattended with a pit bull. Oh, wait. That's what Ms. Beaver said in the preceding news article.